Here's just a few cards I made and had on display for my first class of the year last weekend using some new products including Brusho and some Sale-a-bration items. My catalogue launch display featuring Brusho. I've also used some new dies that I've earned for free thru the Sale-a-bration promotions. If you don't know how that works, please ask me. Here's a pic of each of the cards so you can see more of the detail. I kept them all very simple to allow the Brusho backgrounds to be the focal points of the cards. Thanks so much for stopping by to view my display. Any comments or suggestions are appreciated. I love hearing from you. Have a great day. Did I tell you I was behind with my blog posts? It was Dad's birthday on the 1st, New Year's Day. This was the card I made him for his 80th. This card uses paper from the Wood Textured designer stack along with the Large Number thinlits and cardstock of Basic Black, Whisper White and Gold foil. The design of this card is a bit different with the square cut out and square inner fold. I have photographs of both angles to give you the idea. Here is what the card looks like looking down from the top. I hope you've enjoyed seeing this card that I made for Dad's 80th. If so please drop me a comment, I love hearing from you and enjoy the rest of your weekend. I am way behind with my posting. That's life I suppose. Wish Father Time would slow down a bit because I can't believe its already the 20th of this month. I wanted to quickly share this Easel card I made for a friend of my daughter. My youngest daughter and her friends are all turning 17 and the young lady that I made this card for actually turned 17 on New Year's Eve. The stamp set I've used for this Easel card is Flourishing Phrases. The butterflies and Birthday greeting are from retired sets Papillon Potpourri (butterflies) and Well Scripted. The flowers were coloured with watercolour pencils and blender pens and I've used the Large Number framelit dies to cut out and raise the number 17 using what's known as the Eclipse technique. The cardstock used was Fresh Fig and Whipser White. I hope you've enjoyed seeing my card even though I made this weeks ago. 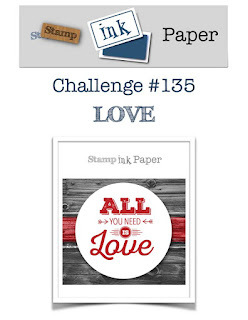 Welcome to this week's challenge at Stamp Ink Paper which is a sketch challenge (below). 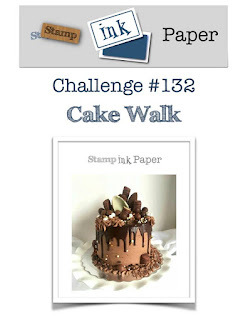 Here's my card using some new product from the Stampin' Up! 2018 Occasions catalogue and Sale-a-bration brochure. I have used the Petal Passion Designer paper and Petal Pair textured impressions embossing folder from the catalogue and the Heartfelt Blooms stamp set from SAB. The cardstock I've used is Berry Burst, Basic Black and Whisper White. I have fussy cut the floral image from the Heartfelt Blooms set. Its one of those that does not have a matching framelit, lol. I do love the pop of colour Berry Burst gives me combined with the Black and White here and quite pleased with the finished card. 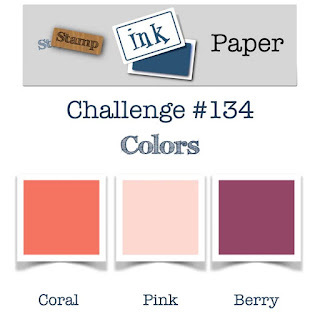 Thanks for joining us this week at the Stamp, Ink, Paper challenge. We look forward to seeing you there. Have a great day. Happy New Year to you and welcome back to the first Stamp Ink Paper challenge of 2018. 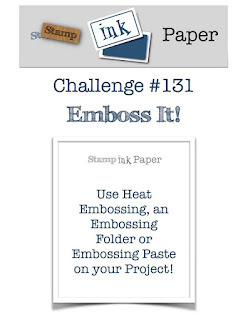 We have an embossing challenge for you whether that be adding texture with an Embossing Folder, Heat embossing or Embossing Paste, or a combination of those options. Here's my card combining the new Petal Palette Bundle with the Pinewood Planks embossing folder. 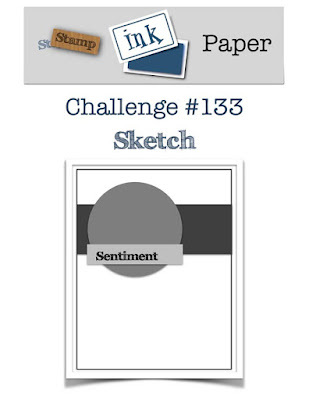 The cardstock I've used is Whisper White, Smoky Slate, an oldie called Not Quite Navy and Old Olive. I've used Stitched Shaped framelits for the greeting which was stamped and heat embossed with Gold embossing powder as was the bird. The Embossing folder was firstly inked inside the front cover with Basic Gray ink before I put in the cardstock and ran it thru the Bigshot. I love how that embossed background looks like weathered wood with the light and dark shades. The bird was coloured with Markers and raised up on dimentionals over the diecut leaves from the Petal Palette set.